It’s Hallowe’en and tonight’s the night when the veil between this world and the next is at its thinnest. The Celts believed that on this night – which in their Calendar was the equivalent of our New Year’s Eve – on this night spirits could swarm across the great divide and return to the places that they had known in life. Of course, with a subject like Jack the Ripper, and the murders for which he was responsible, it is inevitable that several of the murder sites, not to mention buildings connected with his victims, should have gained the reputation of being haunted. So where are the best places to head to tonight to see if you can connect with the world of spirits? One such location is the nondescript private road that runs alongside the Whites Row Car Park off Commercial Street. This was, more or less, the site of Dorset Street where Mary Kelly, the last of Jack the Ripper’s victims was murdered on 9th November 1888. This photograph shows it as it looked at the time. Whist writing his book The Mystery of Jack the Ripper in 1928, Leonard Matters paid a visit to Dorset Street, although its name had, by then, been changed to Duval Street. He was struck by the fact that nobody living in the street at that time (1928) knew anything about its sinister history. One intriguing aspect concerning the murder of Mary Kelly, which Matters makes reference to in his book, is the fact that several witnesses actually spoke of meeting Mary Kelly several hours after doctors stated that she had been murdered. Inevitably it has been suggested that the ghost of Mary Kelly was walking the streets of Spitalfields within hours of her death at the hands of Jack the Ripper. Across the road from the site of Dorset Street stands the soaring bulk of Christchurch Spitalfields. 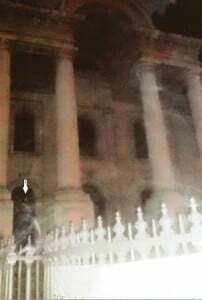 A recent participant on our Jack the Ripper Tour snapped a photo of the church and was somewhat taken aback to find a mysterious figure in one of the church’s recesses. Take a close look beneath the arrow in this photograph. Over the road from Christchurch stands the Ten Bells Pub. This pub is indelibly linked with the Jack the Ripper story, so much so that it was, for a time, renamed the ‘Jack the Ripper’. In the 1990’s, staff who lived in on the premises were troubled by the appearances of, what they described as, “a ghostly old man in grey Victorian clothing.” There was also talk of an “uneasy feeling” that permeated the pub’s atmosphere in the early hours of the morning, whilst some staff even suffered the marrow chilling experience of awakening in the dead of night to find him lying on the bed alongside them! 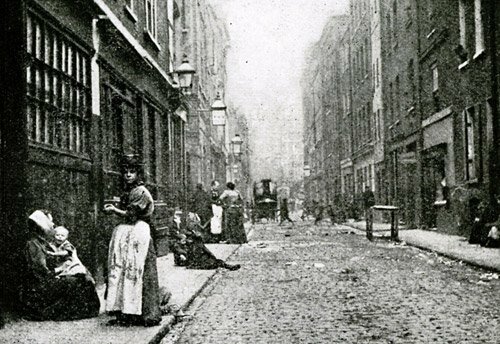 Annie Chapman, Jack the Ripper’s second victim, was reputedly seen drinking in the Ten Bells shortly before her body was discovered around the corner in the back yard of 29 Hanbury Street. The site of the murder is now occupied by the former Truman brewery building and there was always a tradition in the neighbourhood that, on the anniversary of Annie’s murder, 8th September, the brewery’s boardroom would become icy cold. Venturing into the City of London you come to Mitre Square where Catherine Eddowes, the fourth victim of Jack the Ripper, was found murdered on 30th September 1888. Her body was found in the square’s north west corner, pictured here in the 1930’s. There is a local tradition that, at midnight, on 30th September, the anniversary of Catherine’s death, the cobblestones in this corner glow red. So there you have a selection of the sites in the East End, connected with Jack the Ripper, that are reputed to be paranormally active, and which are worth visiting on this night of nights to see if you can encounter a ghost connected with the world’s most infamous murderer – Jack the Ripper. Good hunting!